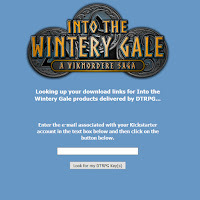 After the initial release of products for the Into the Wintery Gale kickstarter there were many backers not receiving their activation links/codes to download their products. This resulted in a massive customer support effort that took well over a week to resolve. With future products to be released in this line, as well as releases for other Kickstarter projects, I developed a web application for AAW Games/Adventureaweek.com that integrates the Kickstarter records with the DriveThruRPG records and provides an easy "lookup" interface for backers. 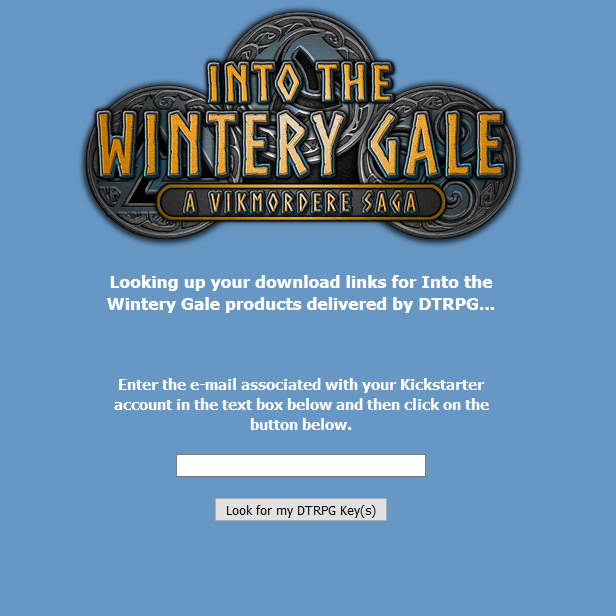 Now backers can lookup the links/codes sent to them (should they not appear in their e-mail inbox as intended) by going to a URL provided in an update and entering the e-mail address associated with their Kickstarter account. For the second wave of product releases, this application minimized customer support to a few hours rather than 100+ hours of labor -- and provided a better response time overall, allowing backers to obtain this information themselves. Since it's initial release, this web application was also utilized for the Aventyr Bestiary kickstarter as well, with similar positive results.It has also been packaged with a configuration file that allows for it to be easily deployed for any potential future Kickstarter projects that include product delivery from DriveThruRPG.